On July 4, 1987, the documentary exhibition “Topography of Terror. Gestapo, SS and Reich Security Main Office on the ‘Prinz-Albrecht-Terrain’” was presented in a newly created exhibition hall designed by the Berlin architect Jürg Steiner. At the same time the terrain, with its excavated remains of several buildings, was equipped with information panels commenting on the site’s history. The exhibition – designed as part of the central historical exhibition “Berlin, Berlin” in the Martin-Gropius-Bau – was originally intended to be shown only for the duration of the anniversary year. But as a result of its immense success, at the end of 1987 the decision was made to extend the temporary exhibition until the end of the following year and finally, for an indefinite period. In February 1989 the Berlin Senate appointed a commission of experts under the chairmanship of Professor Reinhard Rürup, scholarly director of the “Topography of Terror,” to develop a concept for the long-range design and use of the grounds of the “Topography of Terror.” In its final report of March 1990, the commission emphasized the national and international significance of the historic site and recommended the establishment of a documentation and visitor center. The historic site was to remain mainly as it was with the exposed building remains and traces of the postwar period. These recommendations were accepted as the basis for future political decisions by the Berlin House of Representatives and Senate, and shortly thereafter by the German federal government as well. They were also discussed during two several day-long hearings with the Berlin public and international experts. In 1992 the “Topography of Terror,” a citizen-supported project of the Berliner Festspiele, was first established as a dependent foundation under public law. That same year the state of Berlin invited twelve participants to submit designs to an architectural competition for the new documentation center. In 1993, the winner of the first prize, the Swiss architect Peter Zumthor (Haldenstein), was commissioned to realize his design. In May 2004 the state of Berlin and the German federal government, as joint sponsors of the Topography of Terror Foundation, decided not to complete the building project because of exploding costs and technical building problems. The construction, begun in 1997, had been halted in 1999. 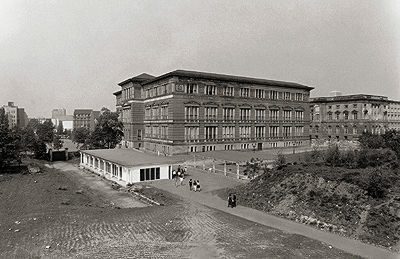 The third competition for the site of the “Topography of Terror” was preceded by a period of intense preparation. A public symposium and two specialist colloquia were conducted on the “Historic Site and Historical Documentation: Building for the Topography of Terror.” A concrete program was developed for the architectural competition under the guidance of the foundation’s executive director Professor Andreas Nachama. The recommendations of the expert commission of 1990 remained the basis for the updated concept.